From the punting battle to Brandon Marshall, here are some day-after thoughts from beat writer Bob Condotta on the Seahawks' second preseason game on everything but Germain Ifedi. 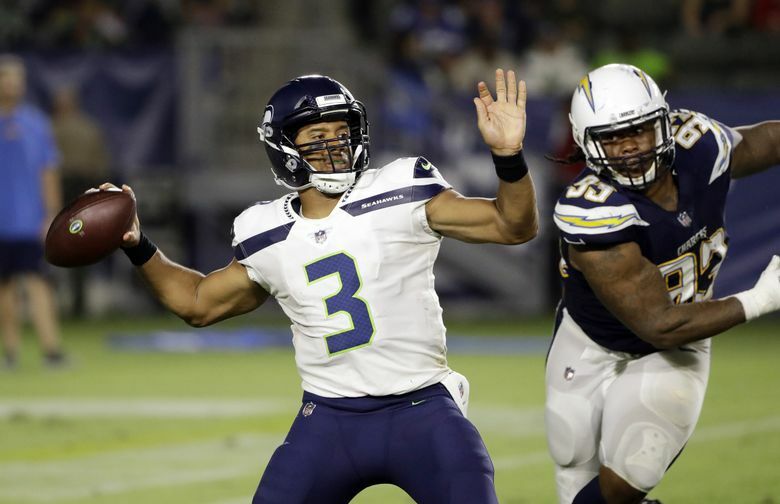 The Seahawks lost to the Chargers Saturday night 24-14 in what felt like a leftover of a preseason football game. So maybe it makes sense that I have five leftover thoughts about what I saw, in no particular order (and yep, I’m going to go the whole way and not mention Germain Ifedi, who was covered in the game recap here). That Russell Wilson guy is still going to be the key to everything. Okay, so it’s not breaking news that a quarterback is a key to a team’s offense, if not the entire team. But Wilson is going to be more key than ever to the Seahawks — even if it’s hard to fathom how he could do more than he has done in the past. The hope is that a Chris Carson-led running game will take some of the onus off of Wilson to have to do everything, and we saw brief glimpses of that against the Chargers. Conversely, the hope is also that an improved running game puts Wilson in better position to make more game-changing explosive plays this season than the past two. It felt like we some some of both Saturday night. On the first snap, a play-action fake to Carson turned into a 29-yard pass to Jaron Brown, exactly the kind of play the Seahawks hope will be the focal point of the new Brian Schottenheimer offense (even if it was also basically a focal point of the Darrell Bevell offense, as well, but we digress). Later, as the pass protection broke down a little bit, we saw Wilson scramble around and make the kinds of plays with his feet as we always have (and also like the touchdown pass to Nick Vannett in the opener). What the Seahawks hope will make Wilson a little better is an emphasis on him keeping his eyes downfield and keeping his feet in a position to make more accurate throws, the latter of which has been at the foundation of Schottenheimer’s work with Wilson during training camp. I was getting ready to make a big deal out of how good Wilson has looked so far until I went back and reviewed his stats from the first two preseason games of last season and realized he was even better then. In 2017, in playing basically the same amount of snaps against the Chargers and Vikings, including the entire first half of the second preseason game, Wilson was 16-22 for 247 yards, 11.2 yards per attempt, and two touchdowns for a passer rating of 139.77. This year, in seven series against the Colts and Chargers, including all of the first half Saturday, Wilson is 17-26 for 236 yards, 9.0 yards per attempt, with one touchdown and no interceptions, for a 107.21 passer rating. So, well, I guess you can’t say yet that Wilson is better than a year ago (though at least last season he had Doug Baldwin to throw to in the preseason). But like a year ago, there’s zero evidence to suggest that he won’t again be biggest thing the Seahawks have going for them. Maybe we don’t need to see Brandon Marshall do much. Marshall played 17 snaps against the Chargers but had just one target, a third-down pass that wouldn’t have been the easiest catch ever but one that he probably could have had and that instead went off his hands, and he has zero receptions in 24 snaps during the preseason with just one target. But after Saturday’s game, coach Pete Carroll said Marshall’s lack of production in the preseason doesn’t matter and basically indicated he has a spot on the 53-man roster entering the season, citing what Marshall has done in practices as evidence of his potential worth to the team. Still, you’d think that Friday at Minnesota — when the starters are likely to play at least one series into the second half, if the Seahawks do things as they have always done things in the Carroll era — they’d probably like to see Marshall at least catch one pass somewhere along the way. Dontae Johnson and Maurice Alexander could get a lot more time going forward to push for starting jobs at safety and corner. The two players may not be well known, but each has significant starting experience – Johnson starting all of last season for the 49ers at right corner and Alexander with 23 starts over the last three years with the Rams. Each played as Seahawks for the first time Saturday, entering the game after the second defensive series, and as each increases his playing time each could become significant factors. Johnson figures to push Byron Maxwell at RCB and likely allow the team to maybe give something of a redshirt season to Tre Flowers, who has been a great story so far but who the team probably doesn’t really want to start at RCB right out of the gate, while Alexander could give the Seahawks a legitimate alternative to pair at safety with Bradley McDougald if they decide he’s a better option than Tedric Thompson (both Alexander and McDougald can play either free or strong and it seems the Seahawks could consider pairing either at either spot alongside each other if they decided those two players were there two best options at safety as long as Earl Thomas is holding out). Alex McGough made the backup QB race that much more interesting. McGough’s struggles in week one led to the idea that maybe he wouldn’t be ready to actually be the backup to Wilson and the Seahawks would go with the steadier option of veteran Austin Davis. McGough, though, looked much steadier than he had in week one — which makes sense that he might be more composed after actually playing in an NFL game, preseason or otherwise — completing 9-12 passes for 97 yards with a touchdown and a 126.0 passer rating. Davis only played two series — McGough played three — and didn’t get a ton of help with a sack and a penalty killing the second drive. But he was just 1-3 for just six yards on the seven official snaps he played (two others snaps were nullified due to penalty). McGough, meanwhile, had 16 snaps highlighted by a 39-yard pass to Cyril Grayson to key a late TD drive which ended in his 12-yard scoring toss to Malik Turner and then a two-point pass to Grayson. The punting battle appears over. Jon Ryan has been a great Seahawk – if his career ended today he’d go down as the greatest punter in team history. And if the Seahawks had to pick their roster today, the best bet is that Ryan’s Seahawks career would indeed be over. Ryan has been just fine in two games. But rookie fifth-round pick Michael Dickson has been better, averaging 53.7 yards on three attempts against the Chargers with a net of 50.0 compared to Ryan’s 44.5 and a net of 8.5 due to a 72-yard TD return (and it’s worth also noting Ryan’s average was held down due to a 32-yard punt from the 47 that was downed at the 15). From the moment Dickson was drafted it seemed only a total faceplant by the former Texas punter would save Ryan’s job. That hasn’t happened — in fact, the exact opposite has — and it appears it’s only a matter of time until the player who is the last one remaining on the roster to predate the arrival of Carroll will probably be gone (and it was telling that Dickson handled holding for Sebastian Janikowski just fine, something that was thought to at least play a minor part in the ultimate decision since Ryan has been an expert holder for a decade while Dickson has little experience at it). As he has throughout camp, though, Carroll insisted after Saturday’s game that nothing has been decided and that the competition will continue.